After netting a hat-trick at one of Britain’s most iconic stadiums, Andre Gray feels that he’s got his appetite back when it comes to scoring goals. With competitive football set for a return for the Clarets in just over a week, the record signing’s form is starting to peak at the right time. 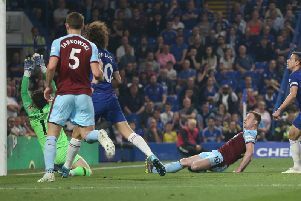 The 25-year-old was the first visiting striker to net three times against Rangers on their own turf in over a decade as the Clarets cruised to a 3-1 win in their penultimate pre-season outing. The club’s record signing beat Wes Foderingham twice to cap a commanding first half display in Glasgow and then beat former team-mate Matt Gilks after the interval to emulate one-time Hibernian forward Ivan Sproule’s feat in August 2015. Gray, whose first hat-trick in the Football League sparked a 23-game unbeaten run last term, said: “It was a good day. Obviously it’s a friendly and it’s more about match fitness and sharpness but it was good to get three goals. He added: “It doesn’t guarantee that I’m going to score in the Premier League but it’s good to keep scoring, getting in the habit and getting that appetite back. Hopefully I can take that in to the Premier League. The former Brentford man, who was rewarded with a place in the PFA Team of the Year last season after topping the Championship scoring charts, was partnered by Sam Vokes for the first time during the club’s preparations for the top flight. The pair last played alongside each other as the Clarets secured the title with a 3-0 win against Charlton Athletic at the Valley in May but Gray insists that they’re getting back to speed. “I think we’re in perfect shape at the minute,” said Gray, who has now scored eight times in five pre-season appearances. “There’s still a lot of work to do but I feel we’re in the right position with two weeks to go. “It’s been a while. He’ll be fit again in a week or two so it’s all about getting him back in to it now. I’m sure he’ll be raring to go a week on Saturday.